Herbert Smith Freehills has today launched a new textbook, Class Actions in England and Wales. 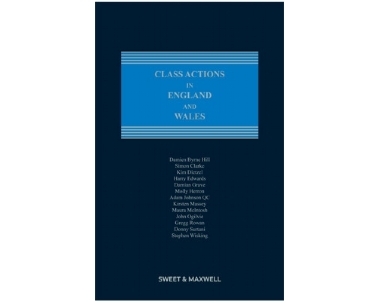 Written by lawyers from the firm and published by Sweet and Maxwell, it aims to become an essential resource for those bringing or defending class actions in the English courts. Class actions have become increasingly prevalent in this jurisdiction, with growth fuelled in part by the activity of claimant firms and litigation funders. It is an increasingly important area for the firm and its clients. Gregg is a dispute resolution partner in our Melbourne office. Maura is a professional support consultant in the firm's commercial litigation practice.